Tin House Books, 9781935639725, 275pp. he Dismal Science tells of a middle-aged vice president at the World Bank, Vincenzo D'Orsi, who publicly quits his job over a seemingly minor argument with a colleague. A scandal inevitably ensues, and he systematically burns every bridge to his former life. After abandoning his career, Vincenzo, a recent widower, is at a complete loss as to what to do with himself. The story follows his efforts to rebuild his identity without a vocation or the company of his wife. An exploration of the fragile nature of identity, The Dismal Science reveals the terrifying speed with which a person's sense of self can be annihilated. It is at once a study of a man attempting to apply his reason to the muddle of life and a book about how that same ostensible rationality, and the mathematics of finance in particular, operates--with similarly dubious results--in our world. Peter Mountford s debut novel, "A Young Man s Guide to Late Capitalism," was the winner of the Washington State Book Award and a finalist for the VCU Cabell First Novelist Award. NPR.ORG selected it for the Books We Like series, the "Daily Beast" picked it as a great summer read, and the editors at Kindle named it one of the most exciting books of the season; it was also featured in the "New York Times Magazine," "Vanity Fair," "Town and Country," "Interview," and the "Wall Street Journal," among other venues. Mountford s work on "The Dismal Science" has won grants from 4Culture, Seattle s Office of Arts and Cultural Affairs, and the Elizabeth George Foundation. The Corporation of Yaddo awarded him its 2010 Wallace Fellowship for a Distinguished Writer so that he could work on the book. His short fiction and essays have appeared in the "Atlantic," "Best New American Voices 2008," "Conjunctions," "Salon," "Granta," "ZYZZYVA," and the "Boston Review." He s currently a writer-in-residence at the Richard Hugo House and at Seattle Arts and Lectures. He lives in Seattle, Washington. "Mountford has written a distinctively entertaining novel that illuminates the spiritual odyssey of a contemporary Dodsworth." "A savvy, fast-paced novel . . . a bracingly intelligent novel." "Mountford pulls off impressive feats of empathy: he creates compelling characters out of self-interested economists, and makes the nuances of financial policythe "dismal science" of the book's titleaccessible to lay readers." "A novel about identity, rationality and starting over, Mountford's book follows a former VP at the World Bank as he tries to rebuild his life following a series of scandals and losses." "Mountford’s wry look at middle-aged identity and transition is a sardonic yet sobering portrait of what happens when a man living a life too narrowly becomes confounded when confronted with too many choices." "A simmering new novel about the underside of global finance . . . . [The Dismal Science's] exploration of a man who can't seem to find his way out of darkness partly of his own making has a beauty that is as delicate as the fleeting hope in Vincenzo's story." 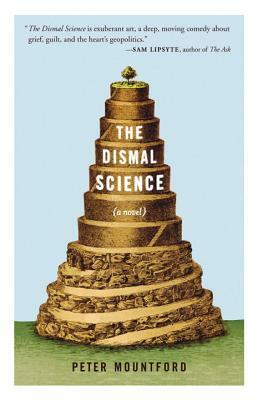 "The Dismal Science is a phenomenal book." "Forget the brainy financial prognostications of Don DeLillo; in Mountford’s stories, capitalism hits you in the gut. Bankers and novelists unite!" "Quietly wrenching, sharply drawn and completely un-put-downable. With The Dismal Science, Peter Mountford asserts himself as our generation’s most significant business-world ombudsman. A deft and unflinching exponent of the human side of a polarizing world few of us actually understand." In his fiercely intelligent second novel (after A Young Man’s Guide to Late Capitalism), Mountford examines, with wry humor and sympathy leavened with a realistic accounting of Vincenzo d’Orsi’s flaws and failings, the repercussions of a decision made in haste andperhapsregretted at leisure. Or not regretted. Who could have ever predicted that an economist at the World Bank could be such a terrific main character? I absolutely loved The Dismal Science." "Peter Mountford's elegantly written The Dismal Sciencean advance on his superb first novelis an extremely impressive imagining by a relatively young writer into a relatively old man's life. It also is a brilliant extrapolation of the economist's 'dismal science' into a metaphor for the difficult fate of any living, breathing, dying human being." "A Young Man’s Guide to Late Capitalism is a terrific debut novelsmart, moving, beautifully written. Peter Mountford's parable of the voracious global economy reminded me of Graham Greene's The Quiet American in its clear-eyed depiction of the realpolitik of our age." "A Young Man’s Guide to Late Capitalism is, quite simply, one of the most compelling and thought-provoking novels I’ve read in years. It’s extraordinarily vivid, populated by characters whose fates I cared about desperately, beautifully written, timely beyond measure, but above all it conveyswith impressive precision and nuancehow we are vectors on the grid of global capital; how difficult it is to even attempt to be an authentic, let alone admirable, human being when we are, first and last, cash flow." "Peter Mountford’s A Young Man’s Guide to Late Capitalism is a sharp, funny and terrifying novelin a world so much like our own (part of the terror: it may, in fact, be our world), Gabriel’s actions and the reactions of those around him caused me to wonder, again and again: how do I wish to live in this world, and what latitude might I find?" "This is Mountford’s triumph: he has created a commentary on contemporary economics that is as moving and genuine as it is biting and satirical . . . A Young Man’s Guide to Late Capitalism will be remembered as a touchstone work of the Era of Twenty-First Century Economic Crises." "Compulsively readable . . . Daringly allegorical and written with apt understatement, A Young Man's Guide to Late Capitalism appears as a Trojan horse within the realm of contemporary literary fiction. Mountford has the courage to depict a world in which personal lives aren't really that personal." "Debut novels don't come much savvier, punchier, or more entertaining than [A Young Man's Guide to Late Capitalism]." "Several things set Peter Mountford's impressive debut, A Young Man's Guide to Late Capitalism, apart from the few finance-driven novels that have emerged in the wake of the economic meltdown." "In his powerfully-written, quick-paced, and timely debut, Mountford shines a hard light on today’s frantic financial amphitheatera place where morality is secondary to making a dollar and large companies can sabotage entire countries." "Peter Mountford’s debut novel speeds off, down the crowded streets of La Paz. If Graham Greene and Gordon Gekko collaborated on a South American travelogue, it would go something like this . . . It turns out 'international markets and their political underpinnings' can be fun to read about, after all."